A couple of weeks ago, an auspicious-looking parcel arrived from Singapore – I knew straight away that it was from Joycelyn of Kuidaore, who makes the most exquisite food, with equally elegant writing. The package was thoughtfully packed full of wonderful goodies – and there was a lovely smell which turned out to be some fresh kumquats. She was anxious about how well they would travel but they arrived in perfect condition and I wasted no time in putting them to use. It’s earl grey tea flavoured mousse cake – in the original recipe, plum compote is added to the tea mousse but I added finely chopped candied kumquats instead (Joycelyn kindly included her home-made candied kumquat in vanilla syrup, it looked, smelt and tasted gorgeous!) 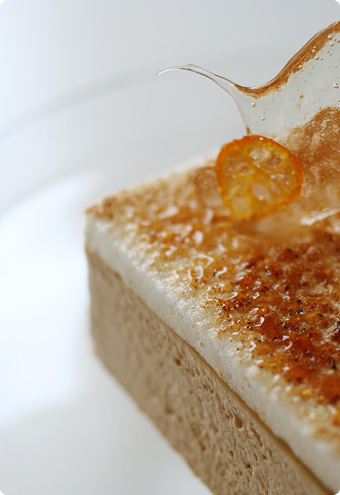 I made almond sponge as a base, and meringue with kumquat zest on top (sprinkle some icing sugar and caramelise with a blow torch just before serving). For the caramel ‘plate’, I oven-dried thinly sliced kumquats and swirled over caramel (you could use caramel with more colour but I think the clear caramel looks nicer on this cake). I wasn’t really sure until I tasted the finished result, but it was lovely – the citrus flavour from both the earl grey and kumquats work beautifully – a very summery, refreshing dessert. I served it with custard sauce (again, with some kumquat zest) and it was a nice finishing touch too. You need to infuse the tea quite strongly, but don’t brew too long as it gets bitter. The pastry dough has kumquat zest as well as juice, I actually loved eating ‘the base’ as it came out from the oven :) For the curd, it was a bit tedious to squeeze all the juice as you can imagine (they are tiny and haven’t got much juice in them) but it was all worth it – rich yet refreshing curd topped with lovely candied kumquats, sprinkled with finely chopped pistachios – I also made pistachio ice-cream and served it with the tart – yum! And last but not least – I found the recipe in one of Hironobu Tsujiguchi’s books – he is a popular patissier in Japan, and as I’ve mentioned before, he is good at creating ‘East meets West’ type recipes (his grandfather and father owned a traditional Japanese sweet shop). 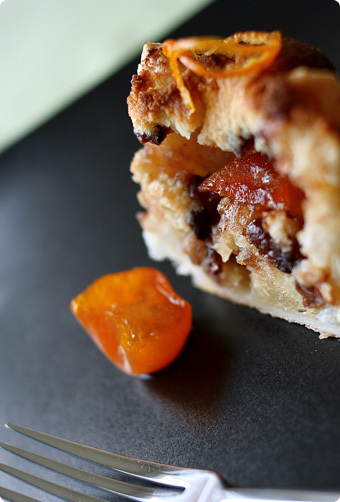 I could use the candied kumquats in this dessert also – they are enclosed in puff pastry, with azuki bean paste and almond cream, then bake the whole ‘parcel’. I hoped it was going to work well and although I wasn’t entirely happy aesthetically, it was delicious and I think it’s an excellent combination of different influences. So tempting photos .. I realize I had never done one dessert with Kumquat yet. Amazing. I love all of these creations... they would go so well with a lavender and kumquat tea I have somewhere in the dark depths of my cupboard. The first photo is beautiful; like stained-glass with suspended fruit. I love the idea of layering citrus flavour with the Earl Grey and kumquats in different presentations. Gorgeous, gorgeous, gorgeous. I study your postings to see how I can learn from your preperations, resentations, and amazing photography (the famous three "Ps"). I’m not even a fan of kumquats (They grow like weeds here in Los Angeles) but this page makes me want to play with some recipes. Thanks for the inspirations! You have reminded me of my grandparents house in Melbourne. They had a huge kumquat tree int he front yard that was always full of kumquats when in season. We used to eat them (love the bitter sour taste) but I never recall my grandmother ever cooking with them (mind you she wasn’t known for her cooking! How many people say that about their grandmother?!). I wish that she still lived there (and I was in Melbourne) so that I could cook with them. Too beautiful for words, Keiko. Excellent job! Now i know what’s been keeping you busy of late. well, I guess that now kumquat will make a hit all over the world:) It’s really magic what you out of food and passion!!!! One question: Would you like to share the exact recipes of your beautiful creations or you will just inform us about their sources. (that would be personal to say I know, but I cannot afford buying all these books- in future YES). Pics looks absolutely mouth-watering. I’ve only tried making marmalade out of kumquats. You have taken this to a completely different level. Hi Keiko, I love how you take a single ingredient and come up with so many beautiful and imaginative ways to showcase it. 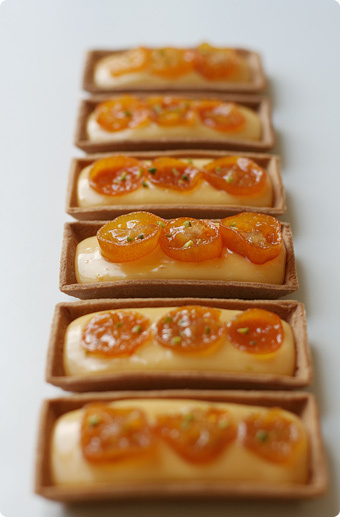 I haven’t eaten kumquats in years, and now all I want to do is track some down and make desserts like these! Inspirational, as always. I used to eat kumquats often when we had a tree but now we don’t anymore i don’t buy them often. I can only agree with Melissa as you really outline the ’gorgeousness’ of kumquats with these three recipes. I’d love to make the tarts and mousse. They look so good. Simply fantastic ! aie aie aie ! It looks really delicious! And the pictures are so nice. 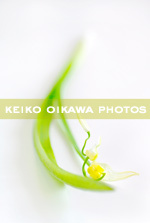 Keiko,I never know what to do first when I visit your blog - pictures or text?? It is all so lovely - the descriptions, the gentle approach you take to preparing everything, the amazing end result. I do mot think that I have ever eaten kumquats so I quite liked the comparison with seville oranges as it gave me something to compare to. Iam not really a kumquat fan especially when it comes to eating them fresh. Although I do like them when they come in a form of dessert.The cake that you make was really outstanding! I would never though of combining earl grey tea and kumquats together, Iam really curious about the combination. Your cake looks just like the one Sadaharu Aoki, it looks so nice or even nicer than the one of Sada should I say.The Valencia cake of Sada is one of his best seller I think, I haven’t try it but I think the cake was pretty complicated which includes dacquoise, dark chocolate mousse, pailette feuilletine layer, chocolate almond sponge, and an orange mousse layer which has orange cognac in it. I personally like the creations of Sada aside from my all time favorite PH. By the way, the tarts also looks so fabulous and Iam a big fan of tarts. The last dessert that you had is so interesting with red bean paste and kumquat as a combination. How I wish that I could try them all.Thanks. This is lovely! I am so glad I wandered onto your blog. I clicked over here because I am trying to favor blogs whose names I don’t understand. Oh my-- what a treat. 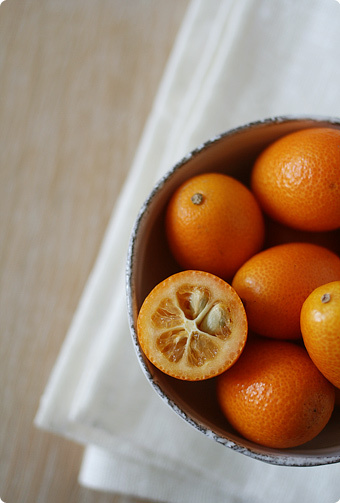 I’m intrigued by kumquats--I’ve seen them in my grocer’s from time to time, but wasn’t sure what to do with them. Next time I see them, I’ll have a better idea. Thanks! I love the picture of the cake! It looks so enticing. I have to get one of Sadaharu Aoki’s books. Thanks for sharing. ps: Kumquats and scallops make a delicious combination too. thank you for another gorgeous post! Hi there, thank you for all your kind notes. Ilingc - your green tea cake looked beautiful! I’m glad you enjoyed it, I’ll try to post more matcha recipes some time. Mae - actually these three desserts together were easier than some of the cakes I make - thanks to Joycelyn for sending the lovely candied kumquats! Basak - I bought Christine Manfield’s book much cheaper last year, you should check amazon often, they might have some in stock in the future. As for the Japanese books, I’m sorry but I just haven’t got time to translate them all right now, I’ll try when I can! Jasmine - I’m sure you can substitute it for orange/lemon recipes. Cenk - oh you must take a photo of Ralph enjoying the treats :) Send him hugs from me! LPC - Sadaharu Aoki hasn’t got any books yet! Kumquats & scallops sound great! Pailette Feuilletine is actually crushed French crepes which is used in cakes. They keep the crunch for a longer period of time as compared to cornflakes and rice crispies. They are quite expensive and usually used by professionals, but by all means you can also uase cornflakes or rice crispies just like what PH did in his Sweet Pleasure. Paillete Feuilletine is usually combined with praline paste, melted chocolate, and butter and spread on top of the sponge cake base. What I know that there were 2 companies which produce it Cacao Barry and PatiFrance. Lovely food and gorgeous photos Keiki. Delicious as usual. I feel happy since I grow this fruit in my terras and I did not know how to use it (apart from eating it as it is!). BTW I just discovered my blog was blocking all comments, sorry for not replying to yours. I used to have so many kumquats and I have no idea what to do with them due to its bitterness and tangy taste. I’m going to try and make some tarts this time. They look so good. Anyway how do i make candied kumquats? i found your blog when searching for PH works, and i stayed. I spent(happily) my latest afternoons reading each entry and looking at each picture and i had to tell you how beutifull everything is. from the writing to the pictures. oh my, with just one type of tiny citrusy fruit, you’ve made a host of delectable desserts.. it has definitely opened up my eyes to the possibilities of kumquat! so, do we get to see these recipes? :P.
Hi there, thanks so much again for all your kind notes. Barbara - I won’t tell him if you don’t! :) Looking forward to seeing your tree some time. Francesco - do you grow it in in London? I’ve seen some garden centres selling the trees, but I wasn’t sure if they are strong enough to grow here. 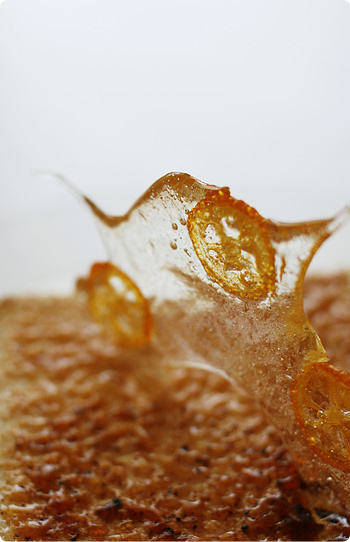 Crysta - I didn’t make the candied kumquats, Joycelyn made them! I believe you just need to cook them in syrup, there seem to be quite a few recipes if you google it. Melissa - thanks for letting me know - I’ll definitely try it, it must be great. Flory - I’ll try when I can! Beautiful! Just Beautiful! The financier molds for the tarts are a great idea. They produce such an elgant shape. I am going to have to try doing that. I personally used rice crispies and cornflakes to substitute paillete feuilletine. It is because the paillete feuilletine is hardly available here in our country plus it is very expensive. The rice crispies and the cornflakes will give the same crunchy effect but the paillete feulletine has a distinct crunch of which I personally think that the substitutes doesn’t have.Paillete Feuilletine also keeps the crunch for a longer peroid of time, maybe twice the amount of the time of rice crispies. But to substitute I like rice crispies better as compared to cornflakes since PH also uses rice crispies. Hi Kitarra - hope you enjoy making tarts with financier moulds or some even more unusual types. You are certainly sucessful in your marrainge of both compositions of the palette and of the eye. One feeds the other with an elevated equilibrium unmatched apart from one another. It is this delicate balance of pleasing the senses for which we all strive to acheive. Thanks for leading by example. Bravo! Hi Terrence – I certainly enjoyed the experiment, thank you for your kind words! I’m hosting AFAM – kumquats and today is the last day. I would love to have your entry. Hi Margot – I’m sorry I missed your kumquat event, hopefully I can take part next time!